We knew going in that it was going to be the longest road trip we’d ever taken. We had looked at options like flying to Denver or Salt Lake City, but decided on an all-car route in the end. Since our first national park was a 20-hour, 1,200-mile drive away, we looked for ways to break up the westward drive into manageable sections. 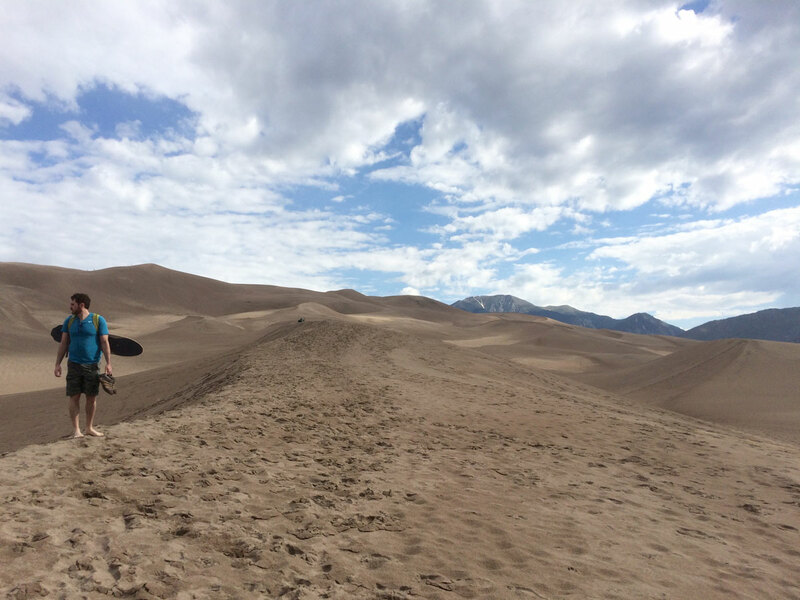 It’s basically two full days to get to Great Sand Dunes National Park in south-central Colorado, so we made plans to stop overnight with our road trip friends Emily and Jake in Iowa City. While in the area, we were introduced to a favorite local hangout, Baxa’s Tavern and Sutliff Bridge. Baxa’s is a classic small town tavern on the banks of the Cedar River about a half hour from Iowa City. A bridge listed on the National Register of Historic Places crosses the river just across the street and is outfitted with picnic tables so you can take your beer and enjoy it over the river. It’s an especially popular destination with cyclists. In Iowa City we had a great dinner at Pullman and quality cocktails at Clinton Street Social Club. 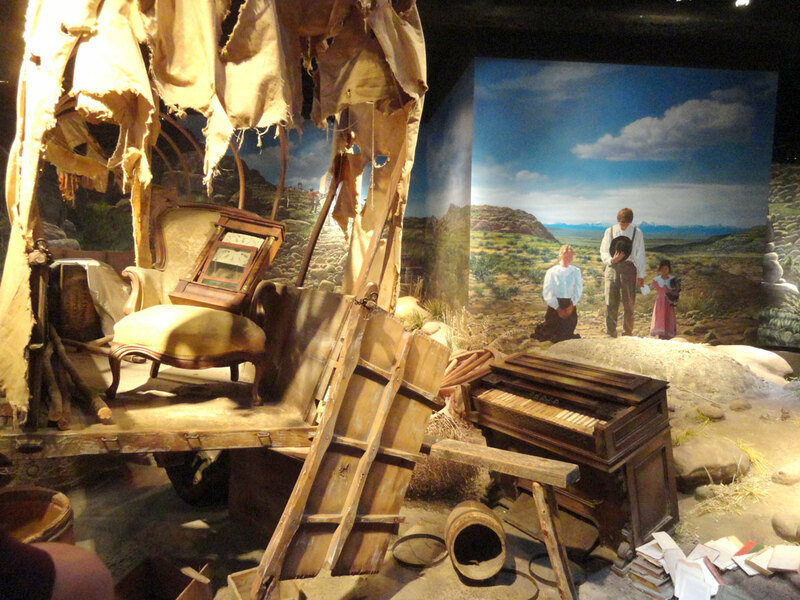 Displays of Oregon Trail hardships inside Nebraska’s Great Platte River Road Archway. Our head start from Chicago to Iowa City allowed us to take our full day of driving at a slightly more leisurely pace. The route across the Great Plains of Nebraska and Colorado can be a tedious one, but breaking it up with some stops can do wonders for making it feel shorter. We’ve passed under the Great Platte River Archway Monument several times and always were intrigued by it, so we finally planned to visit. Anyone who has traveled this stretch of I-80 knows the sight of the giant bridge-like structure stretching across the freeway near Kearney. It holds a historical museum focused on the pioneer trails that brought settlers into the United States’ western territories. The Oregon, Mormon and California trails all converged here at Fort Kearney before proceeding along the Platte River as one. The Archway museum begins with pioneer times and progresses through history from wagon trains to railroads to highways to fiber optic cable lines, all of which first followed this same route across Nebraska. An audioguide narrates as you walk through the exhibits inside, and an outdoor section has some walking trails and re-creations of early prairie housing. Back on the road, we skipped the Interstate and veered south on 2-lane roads into surprisingly beautiful northwestern Kansas toward our pre-planned stopover town of Colby. We selected Colby because of its approximate 8-hour drive time from Iowa City, and because it has a decent selection of hotels due to it being along Interstate 70. The next morning we visited Monument Rocks, the country’s first National Natural Landmark. It’s a cluster of 70 foot tall white cliffs eroded from the otherwise rolling, green landscape. It’s not a site to make a special trip to visit (there are no visitor facilities), so you just find yourself out in the silence of the prairie looking at a rock, but it’s worth a stop if you happen to be passing by, like we were. It was another six hours to get to Great Sand Dunes National park from Monument Rocks. Highway 160 took us across the flat, dry plains of eastern Colorado with the Rockies peeking up over the horizon as a backdrop. Past Walsenberg the road finally climbs into the Sangre de Cristo Mountains and then over the La Veta Pass into the San Luis Valley, where the first park of our trip lies. Sunset from Great Sand Dunes Lodge, wishing we had some good beer. 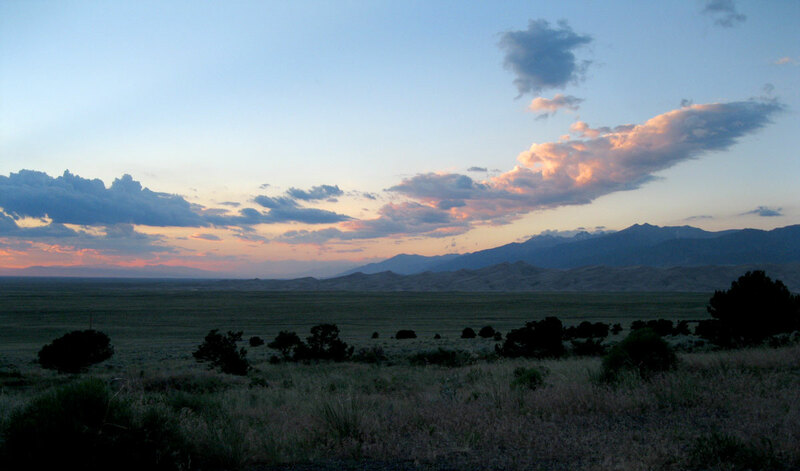 Great Sand Dunes National Park protects in immense field of sand deposited by thousands of years of erosion from the surrounding mountains. Parts of it have been blown and piled up against the base of the Sange de Cristo range, creating the tallest dunes in North America, up to 750 feet deep. In this unique location, shifting winds and bordering streams have created a delicate balance, resulting in a remarkably stable dune field. Our entrance to the park was marked by an impressive afternoon lightning storm (that would prove to be a common theme throughout the trip). We checked into the Great Sand Dunes Lodge, the nearest lodging to the park, located right at the park border. It offers everything you need for your stay in one location: hotel rooms, camping sites, cabins, restaurant, gas station and convenience store. The rooms are large and comfortable and they all have a back patio overlooking the dune field and mountains beyond, perfect for sunset viewing with a beer. Speaking of beer, there’s one piece of information we wish we’d thought of ahead of time. Colorado only allows the sale of beer above 3.2% at state licensed liquor stores, meaning if you buy beer in a convenience or grocery store, all you’ll get is a small selection of the watered down stuff. The nearest liquor store is 20 miles from the park, so we made do with some 3.2 Dos Equis. A shame in a state known for craft brewing. Losing ourselves amongst the dunes. On our full day in the park, we rented sand boards from the lodge and headed off. A parking lot near the visitor center provides easy access to the dunes. Take your shoes off and wade through the shallow Medano Creek to get to the base, then climb up wherever you feel like it. The best method is to select a sand ridge and walk along it toward the top, popular paths are pretty obvious even without markers. Most visitors who hike the dunes aim for High Dune about 2 miles away. It’s a 700 foot high pile of sand that gives 360 degree views of the park. A few visitors continue on toward Star Dune, but most make their way back down. How you descend is entirely up to you. We had carried our sand boards all the way up, so we decided to try them out. We found a nice smallish slope and strapped in. First impression: sandboarding is nothing like snowboarding. The learning curve for sandboarding is pretty steep and sand is not nearly as soft to land on as it would seem. We both had some spectacular wipeouts and for a while we thought Nick wasn’t going to be able to sit for the rest of the trip. While it was a blast, our recommendation is to also consider sand sledding. If we’d rented one sled and one board, we probably would have gotten more enjoyment out of the rental. While the dunes are by far the most popular portion of the park, there are many other areas to explore, including streams and mountain habitats. We hiked the Dune Overlook Trail by way of the Sand Ramp Trail, it’s a short climb, but offers a great viewpoint at the end. We considered the Mosca Pass Trail that climbs through an alpine valley landscape along Mosca Creek, but decided to stick closer to the dunes since we’d get our share of alpine scenery in the near future. One park down and seven to go! 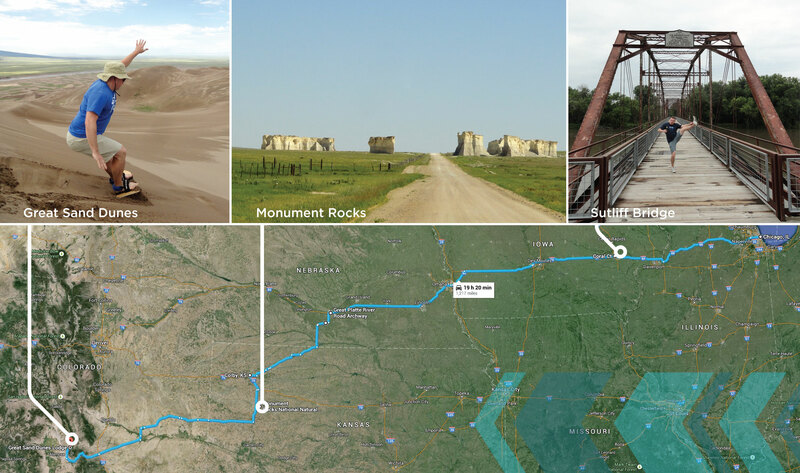 This entry was posted in Destinations, Travel Resources and tagged Baxa's Sutliff Tavern, Chicago to Colorado Road Trip, Great Platte River Archway, Great Sand Dunes National Park, Iowa City Restaurants, Monument Rocks, Nebraska Road Trip, sandboarding, Sutliff Bridge. Bookmark the permalink.